Years ago, ( probably 23 ) my daughter was in a confirmation class and, I was one of the mom's that volunteered for several of the events they were having for the group. During this time, I met a lovely woman, who would eventually become my friend. Together, we started a dinner club. Our original group had 6 couples and, we would meet once a month. We always planned a theme that we would follow. We would break into two groups and each host would pick the menu together. They would then pick a recipe for a dessert and an appetizer to assign to each guest couple. Both houses served the exact menu. Through the years, we have lost members and gained some. We are now four couples! The rules have loosened quite a bit but, we still try to meet every few months. The host still picks what they would like to serve. However, now when they assign the others to bring a dessert or appetizer, the person assigned gets to choose what they bring. Saturday night, we were getting together for one of our dinner parties. I was assigned the dessert! I decided to make a "Dulce de Leche Cheesecake". Dulce de Leche means "sweet milk". It is a traditional dairy product from Argentina. It is used as a topping for ice cream or fresh fruit. In this delicious dessert, it is used to give the cheesecake a delightful caramel flavor. You will need to have a can of dulce de leche, which can sometimes be bought in the ethnic part of your grocery store or homemade. My grocery store did not have any, so I bought a can of sweetened condensed milk and made my own. 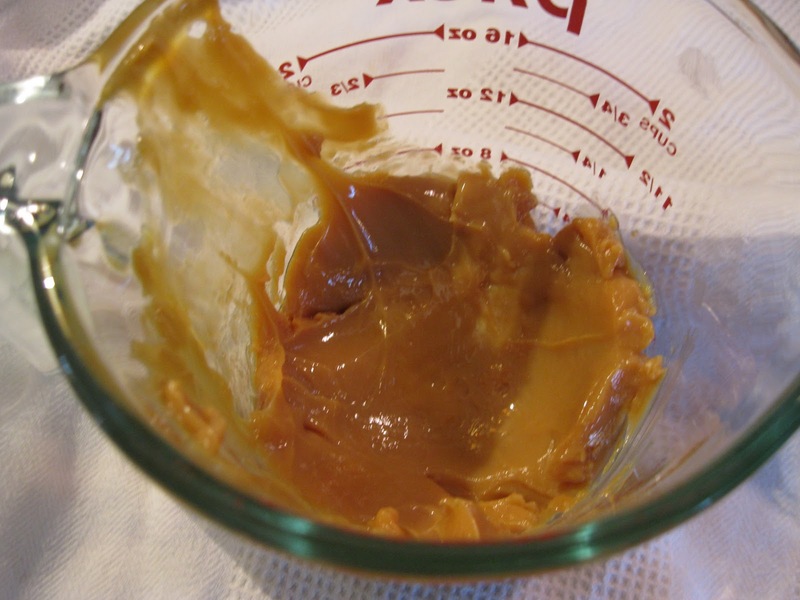 There are different processes for making dulce de leche, the easiest being boiling the can of sweetened condensed milk. It is important to keep the can covered with water during this process, because the can could explode! I use a big soup pot and put the can into it and boil for at least 90 minutes. Keep adding water as needed. After the can cools for about 10 minutes, open and scoop into a small bowl to cool completely. I like to make it a day ahead and not open the can until I am ready to use it. Here is a link to different methods on making Dulce de leche. They do not recommend the boiling can method that I use but, I have been doing it for years and have never had any trouble. This cheesecake is easy to make but does have several steps. For the crust I used dulce de leche maria cookies made by Goya. They really complimented the cheesecake and made a delicious crust. After you mix the cheesecake, take out 1/2 cup of the batter and put into small bowl, then add a 1/2 cup of dulce de leche. Pour the plain cheesecake batter onto the baked crust. Drop tablespoons of the dulce de leche batter onto the plain cheesecake batter. Then, with the tip of a knife swirl it into the plain batter before it is baked. This was truly sinful and was a big hit with our dinner club. Hope you'll give it a try. You won't be disappointed! Extra dulce de leche sauce for serving. Mix crust ingredients together and press into the bottom of a lightly buttered 9 inch springform pan. Bake for 10 minutes. Remove from oven and cool. Beat the cream cheese, sugar and flour together mix well. Add the vanilla and beat until smooth. Then add the eggs one at a time beating well after each addition. Beat until smooth. Add half and half and mix until well blended. Measure 1/2 cup of the cheesecake batter into a small bowl and add 1/2 cup dulce de leche and mix well until combined. Pour plain batter over the crust. Top with rounded tablespoons of dulce de leche batter and gently swirl into plain batter with tip of knife or spatula. Bake in preheated oven for 45 to 55 minutes or until center is almost set. Remove from oven and let cool 20-25 minutes before covering and placing in the refrigerator. Refrigerate 4 to 6 hours or overnight before serving. Serve this with dulce de leche sauce drizzled over the top of each slice or on the plate. You can also pass around a bowl of the sauce so that guests can help themselves. 1/2 cup dulce de leche mixed with enough heavy cream to make a smooth sauce. The can submerged in the water---boil the can for up to 3 hours. Make sure to keep covered with the water! For the crust I used Goya's Maria cookies…they have a dulce de leche flavor. Crust pressed into 9 inch springform pan. Cream cheese, sugar and 2 Tablespoons of flour…ready to beat. This was the lovely dinner we had. Duck Magret with black cherry sauce! Prepared by our hosts Brian and Colleen. Your cheesecake looks so good and smooth! And, the dinner looks delicious as well! Kathy-Thanks for sharing your Dulce de Leche cheesecake, and the sweet story, as well. Loved reading it. I've never made this type of cheesecake, and I've just about made several kinds, but now, I'm so excited to grab your recipe, to make it for Easter...seriously, because every Easter I make a different cheesecake, also for every special occasion. Looks so creamy, and delicious. Kathy, I love the texture of this cheesecake, so smooth and creamy. Your dinner club sounds like so much fun, Kathy. How wonderful that most of you have kept doing it all these years. I have to make this cheesecake - your photo is mouth watering! We love cheesecake of every flavor, but we have never had dulce de leche and with the maria cookies for the crust it just has to be good. Thank you for sharing the recipe. mmm... my hubby would probably love this. he lived in argentina for a few years.